I decided to write up a basic directory of my characters, as much for my own benefit as anyone else's. If any of my characters seem interesting and you'd like to meet them ICly, please let me know! Striking cerelean hair hangs braided haphazardly down her back. A few strands that managed to escape fall across her face and into her almond-shaped eyes, whose soft amber glow usually hints that she is laughing silently at an untold joke. Around her eyes and spread across her cheekbones are dark tattoos of a teal color that stand out against her light blue skin; their bold stripes give the illusion of clawmarks raking down across either side of her face. She's tall and thin like most of her race, though upon closer inspection she has the muscle tone of someone who possess both strength and speed. A few indigo scars riddle the left side of her ribcage, visable through her leathers, and another small mark about an inch long lies horizontal underneath her left eye. Covering her body are light leathers in somber greens and purples with pieces of wooden armor on top for added protection in a scuffle. Her garb appears well worn and broken in, none too tight so that she has ample room to manuver. A staff rests across her back in a sling over her shoulders. Chunks of wood are missing from the weapon, along with a few deep gouges as if from claws. A large jawbone is attached to the staff on one end, though its hard to tell from what creature it came from. The weapon is otherwise free from adornments, save from a few strips of leather wrapped around the middle as a grip. Her only other visible weapon is a small knife the length of her palm tucked into the waistband of her belt at the small of her back. Long hair flows nearly to her waist, the silken lavender strands so light they almost appear a shining silver. It seems particular care is taken to keep ther locks free from tangles, though leaves cascade randomly throughout her thick hair. A few shorter wisps hang in front of her face, but the majority is simply tucked behind her long ears. Her face is youthful by Kaldorei standards. A little less than three and a half centuries marks her as young, barely old enough to be taken seriously. She keeps her chin raised, not with an air of defiance but with the knowledge that she knows her worth. Two amber-hued eyes are visible catching even the faintest light. 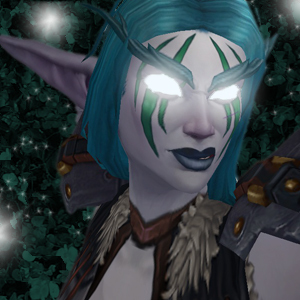 It's unclear whether she was born with them that color, or if they shifted as she progressed with her Druidic training, but now they glow with a sense of recognition that comes from seeing things first-hand. Purple markings can be seen across her eyelids and trailing down her cheeks, in the shape of a rare leaf. The lines are still fairly crisp, the color vivid, and not faded from centuries; given around her 300th name-day, they symbolize her talents as a Druid, particularly one of the Grove, after her skills manifested themselves. Normally found in light armor made of various leathers, she appears to have a certain fondness for shoulderguards made from wood. Tucked behind her belt is a dagger, its curved blade duller than most and ceremonial in nature. A large golden moon hangs on a thin chain above her forehead, catching even the smallest hint of light, and an enchanted ring encrusted with moonstones adorns her ring finger. Attached to her waist by a belt and straps around her right thigh rests a satchel, the fabric pushed into a blocky shape from the hard leather-bound book she carries inside. The journal is full of hand-written notes and observations of plants that she has encountered, and looseleaf parchment and a few dried samples can be seen sticking out between the pages. A feather hangs braided into her hair by her left ear, the green color signifying her rank of Guardian - an officer in the Sentinels. A black raven feather accompanies it, for the Starfury squadron. Attached to her officer tabard are two lapel pins that mark her as a veteran of the unit's Feralas trek. Both pins are made of silver and inset with moonstones in the shape of a small crescent moon, though the second is also surrounded by small golden oak leaves. Her weapon of choice appears to be a plain wooden staff. A few strips of leather are wrapped around the middle for a better grip, but there are no other adornments. It would be hard to say if she is skilled with it without first seeing her in combat. Herbology - Alesune has always been interested in plantlife, and has recently taken up herbalism. She carries a large tome with her, filled with diagrams and texts of different plants she has encountered, and their medicinal uses according to other scholars. Need a plant identified? Alesune is a wonderful person to ask. Scholar - With a love of reading, Alesune has a wide array of books she has transcribed and keeps in a waterproof chest by her bed. If she doesn’t have the text you’re looking for, without a doubt she knows who to ask to procure a copy. 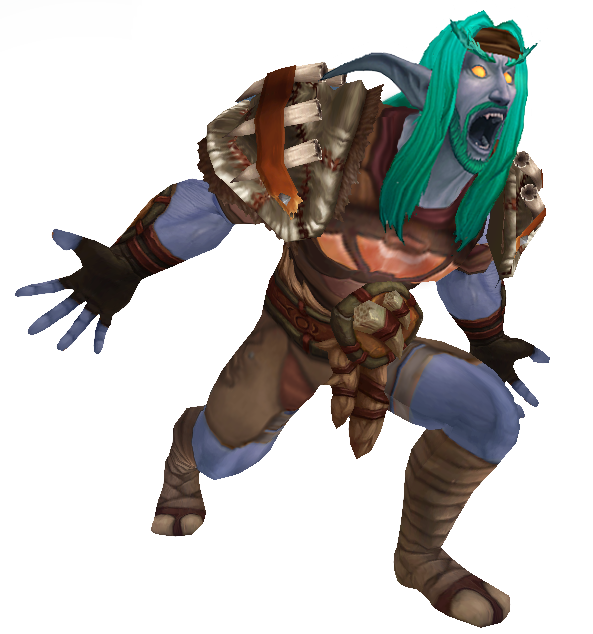 Sentinel Officer - Alesune has moved up the ranks of the Sentinels and is an officer of the unit stationed in Darnassus. Even as young as she is, she’s led multiple excursions on behalf of the Sentinels. Druid of the Circle - Alesune is known within the Cenarion Circle, particularly among those who who follow the path of the Grove. She’s also gathered druids together who work and train together to improve their skills. Thick wire-rimmed glasses can be seen resting across Sabralia's nose when her face isn't obscured by the hood of her robes or the large-brimmed floppy hat she wears atop her head. She keeps her golden hair cropped short and is otherwise average in terms of stature and looks; she's clearly more preoccupied with whatever book she can get her hands on than her appearance. A spellbook often floats behind her, when it isn't stuffed firmly in her satchel. Her tutor in Dalaran enchanted it to follow her after she continuously forgot to bring it to her studies. Mage of the Kirin Tor - Sabralia lived in Hillbrad until the day she was old enough to train with the Kirin Tor. She was anything but gifted with magic; from the lessons the mages taught her, she only really mastered how to light things aflame. Bookworm - The libraries of Dalaran are immense, with multitudes of tomes filled with different kinds of magic. Sabralia would oftentimes read other books besides those that were assigned to her as part of her studies; because of this, her tutor enchanted her spellbook to follow along behind her after she repeatedly forgot to bring it to her lessons. She also has more knowledge on curses and other forbidden magics than an acolyte of her level should ever know. Extra Notes: Sabralia is a warlock in-game, but still considers herself a mage ICly, albeit one who has dabbled in some forbidden magics (AKA curses). She has no knowledge of anything fel-related or how to make a contract with a demon, so if you see a demon out I might be OOC/AFK! Dark hair falls down around Aleitha's shoulders. It's unremarkable in style or color, and her straight locks irk her any time she attempts to do anything other than tuck them behind her ears. Beneath a few rogue wisps of bangs, her eyes tell a much more determined story. Her hazel gaze seems to catch every detail, storing the knowledge away for future use. It gives her an almost angry expression the majority of the time, her narrowed eyes searching for any mishaps under her severe eyebrows. Skin-kissed skin across her cheekbones gives her a healthy glow, amplified when her face flushes during an arguement. Her lips are full and perpetually turned-down at the corners. She'd be almost pretty, if she could get the disdain off her face. Vials of different potions adorn her belt, each in its own separate holster. Slung over her shoulder is a heavy alchemist's satchel, with a mortar and pestle, empty vials, and a few other necessities of her trade. 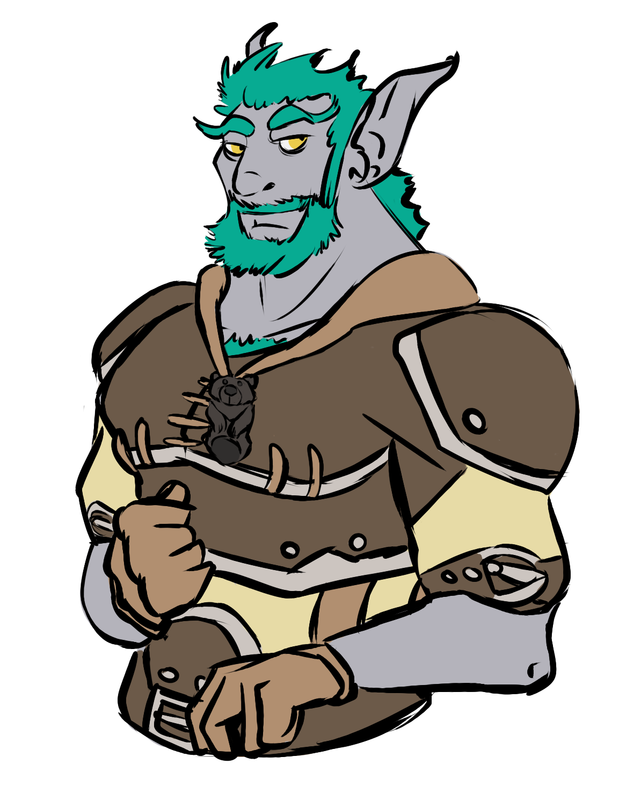 Alchemist - Aleitha grew up in a modest household in Duskwood. Her parents were alchemists by trade, and they would send her off to gather supplies they needed from the countryside around Darkshire. She’s learned how to brew different healing potions and tonics. 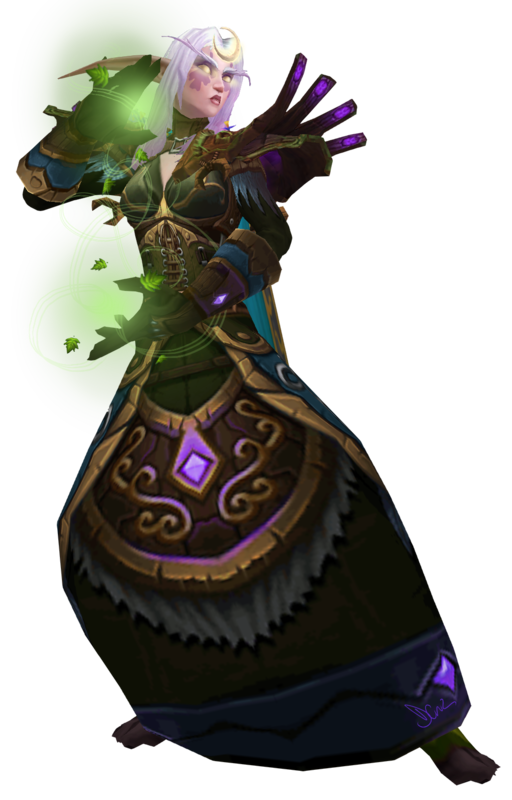 Healer - Aleitha has learned to mend wounds from her parents and also the training she received in Stormwind’s army. Shadow Magics - On one deployment to Pandaria, Aleitha’s unit came across one of the shadowy creatures called the ‘Sha’. After a gruesome battle, the aberration fed her doubts against her allies and turned her against them. While mind-controlled, Aleitha tapped into shadow magics as opposed to the Light that she used to heal. Even after coming back to her senses, she is still able to channel the darkness and warp others’ minds. He keeps his hair untamed and unruly down his back, in contrast to the beard covering his face that looks like he at least attempted to trim. His eyes are a deep gold. Between the straps of his leather harness, four deep scars run along his upper right arm – they almost appear to be claw marks that were not allowed to heal properly. Usually found in rough leathers, Myth keeps his feet and ankles wrapped in thick boots lined with fur to keep his toes warm in cold climates. He keeps a few personal decorations tied on leather thongs that hang against his chest, most notably a few wooden beads and an elaborately carved wooden bear pendant. Druid: Myth is technically a Druid, though he does not associate closely with the Cenarion Circle. Those with a long history with the Circle may know that he was not in good standing with them the last time he left, though the reasons are unclear and full of rumors. To this day, he doesn't spend much time around large congregations of his brethren. Wanderer: Myth carries all of his belongings with him in a large hobo satchel. He's extremely protective of the bag, and travels as light as he possibly can. Furbolg? 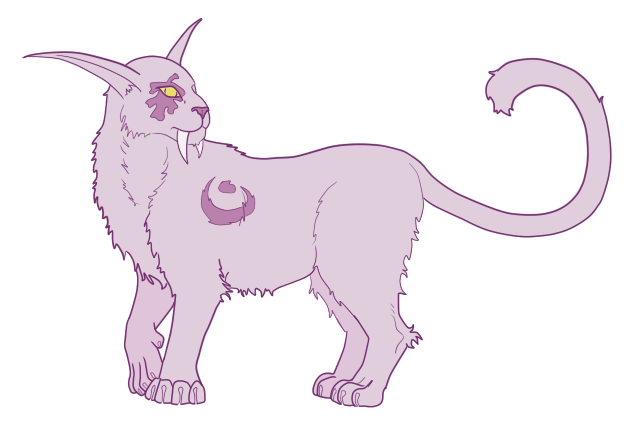 : Rumors have it that Myth has some sort of connection to the Furbolg in Winterspring. The carved bear pendent hanging around his neck seems to prove the theory. Short turquoise hair lies haphazardly atop the Kaldorei’s head, barely brushing past her chin. It looks like it was chopped off unceremoniously, and the majority is tucked behind her long ears out of her face. A few strands escaped, hanging down in front of her silver eyes. Across her cheekbones are faded tattoos that resemble wings in flight. Smaller than most Kaldorei women in both height and build, Aislanna moves with a quick ease that attests to her dexterity. She keeps herself outfitted in leathers and chainmail, though her garb looks light enough to allow for a full range of movement. The gloves she keeps tucked into her belt look heavier than the rest of her attire, stretching up past her elbow when worn and covered with a thick boiled leather hide and chainmail. Usually slung across her shoulder is a simple wooden bow, paired at her right thigh by a full quiver. Each arrow is fletched with different color feathers, though the majority seem to be green and brown hued. Sentinel Recruit: Aislanna recently put in her enlistment papers to join the Sentinel Cadre. She has been transferred to Darnassus. 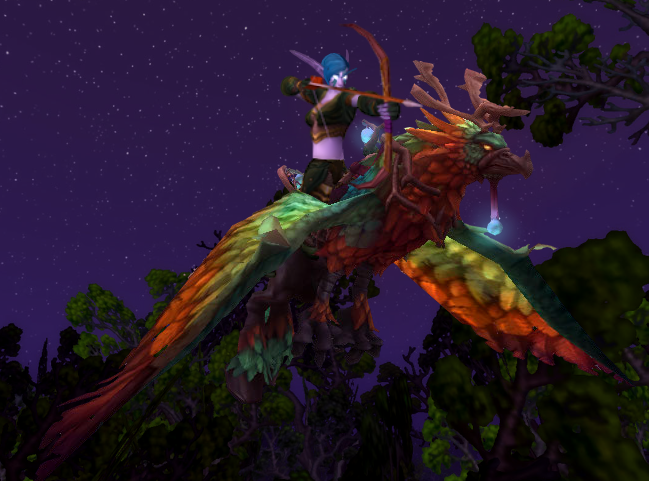 Hippogryph Trainer: Many hippogryphs ridden by the Sentinels have been trained by her or those she works with. She has extensive knowledge of the beasts, and has spent centuries raising them from eggs to care for and train.